There’s an old saying, “shirtsleeves to shirtsleeves in three generations.” In the case of the Hickey Brothers Cigar Stores, it took only a single generation to found the business, manage its glorious expansion, and be devastated by its final bankruptcy. Two young Hickey brothers, William, 17, and John, 12, sold newspapers and saved their money until they accumulated $745. With that nest egg, they opened their first cigar store at 132 E. Third Street in Davenport on April 13, 1901. By 1937 they had 42 stores. At their peak in 1951, they owned 130 stores in 68 cities and 9 states with annual sales of $7 million. Some accounts say that there was a Hickey store at every major trolley stop in the Quad Cities. Downtown Rock Island’s first shops were at the Harper House and the Harms Hotel. Hickey Brothers Store Number 12 became the star tenant in the corner store of the Fort Armstrong Theatre building in 1921. Just across the street, Hickey Brothers Store Number Five was installed in the lobby of the new Fort Armstrong Hotel in 1924. This is what was supposedly shown on this postcard today. But, it’s not! It’s obvious from the postcard that the Hickey Brothers stores were a model of elegance. The overall theme was green and shiny gold with a script “Hickey Brothers” as the logo. Interiors were furnished with fine woods, marble, and brass. Notice the border above the wood cases with their stylized “H”s. The mosaic tile floor is embellished with a similar initial. The worst job in here would probably have been polishing the brass spittoons. The many cigar choices are represented by the dozens of open boxes in the counter. Stores were maintained in such prestigious hotels as the Waldorf Astoria in New York, the Drake and Blackstone in Chicago, and even one in Havana, Cuba. By 1951, the chain was the third largest cigar store company in the United States. But calling the Hickey empire a chain of cigar stores doesn’t begin to convey what the business was really about. Hickey Brothers was more than just cigars. They sold specialty candy, pipes, billfolds (as wallets were called then), lighters, and a selection of out-of-town newspapers. 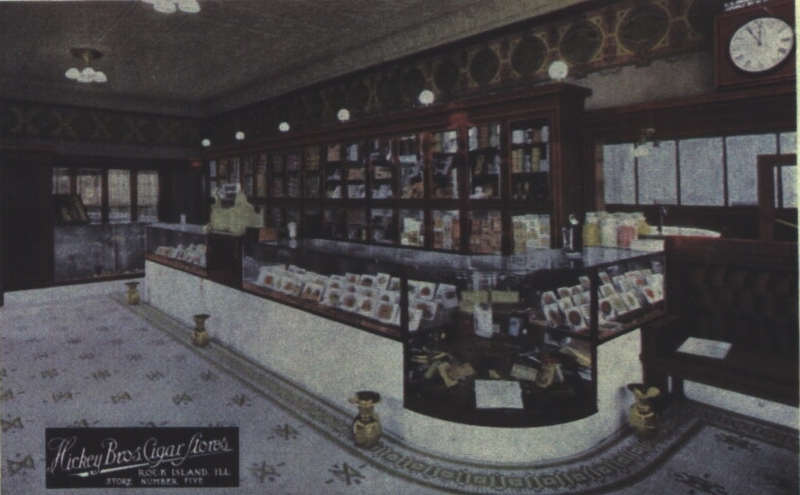 Many of the independent stores – the ones not in hotel lobbies – also maintained a lunch counter. Hickey’s didn’t have an ordinary dimestore style lunch counter. Rather their counter lunches, although eaten by patrons perched on stools, featured gourmet quality cooking with a specialty of fresh seafood brought in by rail. By 1957, only six years after hitting its maximum sales, the business was in a recession. John, who was reported to be largely a figurehead, had died in 1943, but older brother William continued as the undisputed leader of the company. So committed was he that he invested $350 thousand of his personal wealth in the failing business. It wasn’t enough. Hickey Brothers filed fpr bankruptcy in 1957. It was reported that William signed the bankruptcy papers with the flourished “Y” on his signature that had been the store trademark for decades. He died only two years later at his home in Davenport. And here’s a postscript to the Hickey story. After a hiatus of forty years, the name was revived by in 1997 by Mike King, a cigar lover and entrepreneur, who started a new cigar store under the Hickey banner. His merchandise is all smoking-related and specializes in dozens of varieties of cigars. Now located at 124 18th Street in the District of Rock Island, it’s well worth a visit, even by non-smokers, just to see the cigar memorabilia. And remember how much fun cigar boxes used to be? You can buy one at the new Hickey’s, either solid wood or fancy paper covered, for a few dollars. John Willard has written a detailed history of Hickey Brothers stores that can be found at the website www.hickeybrothers.com Vintage pictures of Hickey stores can be seen there as well. This article, by Diane Oestreich, is modified slightly from the original which appeared in the Rock Island Argus and Moline Dispatch on August 25, 2002. AFTERWORD: After this story appeared in the newspaper, two readers called to say that this picture was NOT Store No. Five, despite its label. The one in the hotel was much smaller. Both also agreed that it was not the one in the Fort Theatre building, just across the street – the tile floor there was different.